Ibraaz is pleased to announce the publication of our third book in the Visual Culture in the Middle East series, Future Imperfect: Contemporary Art Practices and Cultural Institutions in the Middle East. Buy the book via the Sternberg Press website and on Amazon.de. Read the introduction, “Critical Propositions and Institutional Realities in the Middle East” by Anthony Downey, by clicking here. #FutureImperfect critically examines the role played by cultural institutions in producing present-day and future contexts for the production, dissemination and reception of contemporary art in the Middle East and North Africa. It offers critical contexts for a discussion that has become increasingly urgent in recent years – the role of culture in a time of conflict and globalization – and an in-depth critique of the historical state of cultural institutions in an age of political upheaval, social unrest, exuberant cultural activity, ascendant neoliberal forms of privatization, social activism, and regional uncertainty. Organised around three key areas, Future Imperfect draws attention to the specific antagonisms that have affected cultural production across the region, both in historical and more recent post-revolutionary contexts, and offers an in-depth discussion of how cultural producers have developed alternative institutional models through their practices. How cultural institutions operate within the conditions of a global cultural economy, and alongside the often conflicting demands they place on cultural production in the region, is likewise an over-arching concern throughout this volume. While the politics of contemporary cultural production and institutional practices in the Middle East can tell us a great deal about local and regional concerns, one of the cornerstone ambitions of this volume is to enquire into what they can also impart about the politics of global cultural production, including the multiple ways in which contemporary art practices are being reduced, willingly or otherwise, to the logic of global capital. What, in sum, is needed in terms of infrastructure for cultural production today, and how, crucially, can we speculatively propose new infrastructures and institutions in the context of present-day regional realities? Monira Al Qadiri, Myth Busters VIII, 2014. Future Imperfect contains essays, interviews, and projects from contributors including Monira Al Qadiri, Hoor Al-Qasimi, Anahi Alviso-Marino, AMBS Architects, Stephanie Bailey, Eray Çaylı, Rachel Dedman, Elizabeth Derderian, Anthony Downey, Karen Exell, Reema Salha Fadda, Wafa Gabsi, Hadia Gana, Adalet R. Garmiany, Baha Jubeh, Suhair Jubeh, Amal Khalaf, Kamel Lazaar, Jens Maier-Rothe, Guy Mannes-Abbott, Doreen Mende, Lea Morin, Jack Persekian, Rijin Sahakian, Gregory Sholette, Tom Snow, Ania Szremski, Christine Tohme, Toleen Touq, Williams Wells, Ala Younis and Yasmine Zidane. The publication is accompanied by a collection of special projects from Leila Al-Shami, Wided Rihana Khadraoui, Lois Stonock, Nile Sunset Annex, Alia Rayyan and Hussam al-Saray. Click here to view the online projects commissioned for Future Imperfect. Other titles in the Visual Culture in the Middle East series, edited by Anthony Downey, include Dissonant Archives: Contemporary Visual Culture and Contested Narratives in the Middle East (2015); and Uncommon Grounds: New Media and Critical Practices in North Africa and the Middle East (2014). The production of this book was accomplished through the generous support of the Kamel Lazaar Foundation. Ahead of dance troupe Badke’s UAE premiere at the NYUAD Arts Centre on 9 September 2016, here’s a re-post of my interview with dramaturg and choreographer Hildegard De Vuyst. We caught up when Badke were invited to perform at the Southbank Centre in London for the Shubbak Festival 2015. Aimee Dawson: Badke is a take on the traditional Palestinian dance dabke but it is fused with contemporary elements. The performance itself is not an outright assertion of Palestinian identity but is rather trying to find a sense of Palestinian belonging, both nationally and internationally. Was bringing a contemporary side to the traditional dance an important element in getting across that message? Hildegard De Vuyst: Dabke has been built over years and is the result of an ongoing dialogue with a variety of Palestinian performance artists, whatever their background. We were regularly visiting Palestine and having all of these exchanges in the form of workshops. The three co-creators, Koen Augustijnen, Rosalba Torres Guerrero and myself, had worked with a group of ten Palestinian dancers in 2009 and it was then that we understood that bringing in contemporary dance was not an easy thing to do or to cope with – you come across a lot of big issues that are related to politics, colonialism, aesthetics and values. Everything in this piece has been negotiated with the dancers – the material is theirs. This was important so that the dancers could really defend it – the dance is made up of their own proposals and they know exactly why it is there and what it means. We started with the dabke dance for this reason but also because this is what the Palestinians have to offer the world of dance – it’s not contemporary but it’s theirs. This is what they all have as a starting point, this collective dance that is connected to the soul. So for us, to start from dabke meant starting with their strength and what they have to offer and not from what they are supposedly lacking. AD: The ten Palestinian dancers come from a variety of dance backgrounds. Was it important for you to showcase these differences? HDV: Yes, the other thing that was important for us was working with non-professionally trained dabke dancers. There are lots of trained dabke companies in Palestine that really know what they are doing but we wanted to work with individuals, not an already-established group. We also wanted to work with people who were from a variety of different backgrounds in terms of training, socio-economic position, and geographic location. Two come from the Palestinian Circus School; two have come from Israel and have had training at Kibbutz Contemporary Dance Company; three come from Serreyet Ramallah Dance Company; one from El-Funoun Popular Dance Troupe; and three are completely self-taught – two are from a refugee camp near Nablus and one is the Palestinian kickboxing champion! And so the element of ‘contemporary’ comes from each dancer bringing their own experience to the performances and sharing with one another. It is a very diverse group of people with different things to offer. What was a triumph for me was that the piece was actually embraced by the traditional dance companies. AD: There is always the concern when you are reinterpreting a traditional dance of national significance that it will be in some way offensive. But I read that, at a show you did in Palestine, a very traditionally dressed woman came up afterwards and said, “When my girls grow up I want them to be like that”. The audience for that show was also huge despite concerns that this type of dance wouldn’t be accepted. It must be really great to get such a positive reaction, particularly in Palestine where this performance has extra significance and resonance. HDV: Yes, they somehow really felt like we respected the tradition and that at the same time found a way to deal with something that was contemporary. I think it is mostly in the composition of the piece that you find the contemporary, through the use of space; the use of the group versus the individual and then the re-emersion of the individual back into the group again. It is almost a reflection of Palestinian society on an existential level. Behind the scenes: Badke working with the Congolese dance company Ballet Arumbaya Ndendeli in Kinshasa. Photo courtesy of Samaa Wakeem. AD: One of the things that stands out in the videos and reviews for Badke are the comments on the overwhelming energy and positivity of the piece. Do you think that this is just part of the nature of the dabke dance or is it something that you really wanted to portray? HDV: Part of it is in the nature of the dance because it’s very affirmative, with a lot of stamping and shoulder shakes. There is an affirmation of “I belong here” and creating a connection with the ground is a very joyful thing. But we were particularly interested in dabke as a social dance rather than the way that it is often portrayed on stage where it’s often used as a representation of Palestinian suffering. For us, the piece is a feast – a wedding but without a bride and a groom! It has this energy that Palestinian weddings parties often have, this wild energy which is also a way to release tension and energy that can’t go anywhere else. So the energy and the vitality of it is one part. But for me, it should also be read as a party that goes on for too long. It’s exhausting itself and emptying itself. For us in the end it’s like the people in this party cannot stop dancing but just have to continue. They turn in rounds and they keep turning – they cannot go anywhere, they cannot stop. It becomes painful. For us it’s a reflection of what is going on right now in Palestine. They are stuck and they cannot stop resisting. They have to go on but it’s not going anywhere. So it ends in a section that is both dream-like and nightmarish, of both joy and pain. That’s what we aim for. Sometimes it’s clearer than others – over time, as the dancers have improved their stamina, it has become more acted whereas before they were genuinely feeling this emotion of pain! AD: This is the first time that Badke has been to the UK but it has travelled to other places, too. Can you tell us about the tour? HDV: Yes, it is a tour with a great deal of contrast. Recently we took it to Salzburg and after that we went to Kinshasa. The Koninklijke Vlaamse Schouwburg (KVS, The Royal Flemish Theatre) put on a festival in Kinshasa called Connexion Kin and so we included Badke. For the Congolese dancers there is a lot of traditional material still there but it is sometimes translated rather problematically into the contemporary world of dance – you would never find a traditional Congolese dance company at a contemporary dance festival and we wondered why. While Dabke were in Kinshasa they met with a traditional Congolese dance company called Ballet Arumbaya Ndendeli and it was an incredible experience. The dancers worked together, like an exchange, for two days. They each taught the other a phrase from their own choreography. The Palestinians were really inspired by the Congolese body movements – in dabke there is no movement between the chest and the knees – and suddenly in Kinshasa they discovered their pelvis! It’s incredible how it changed their relationship to their bodies and I’m sure now Badke will look different than before! Book tickets to see Badke’s at NYUAD Arts Centre, 9 September 2016, here. Read this interview on the Shubbak Festival blog here. Qatar Museums (QM) is due to stage a major retrospective of the Iraqi Modernist artist Dia Al-Azzawi in October. The exhibition is believed to be the largest-ever solo exhibition of works by an Arab artist. Spanning two venues in Doha, Mathaf: Arab Museum of Modern Art and QM Gallery Al Riwaq, the exhibition will cover 9,000 sq. m and include 400 works. Curated by Catherine David, the deputy director of the Centre Pompidou in Paris, the show includes works in a variety of media, including painting, sculpture, drawing, print and artist books, as well as original and limited editions of works on view for the first time. The two venues, across the city from one another, will highlight two different narratives in Al-Azzawi’s work. The first will focus on the artist’s use of image and text, and the other will trace the artist’s engagement with the political history of Iraq and the Arab world. Al-Azzawi, who was born in Baghdad in 1939, has been a central figure in Iraq’s art scene. Before moving to London in 1976, where he continues to live and work today, Al-Azzawi was the director of the Iraqi Antiquities Department in Baghdad and an active member of the country’s emerging art groups at the time. “Al-Azzawi is considered one of the most important artists of the Arab world and for the first time a major retrospective will allow visitors to study the evolution of his practice and themes,” says Sultan Sooud Al-Qassemi, the founder of the Barjeel Art Foundation, whose collection features many works by the artist. Alongside 90 works from the QM collection, the exhibition will feature loans from 17 private collections and four institutions, including the Barjeel Foundation, Sharjah; Centro de Arte Moderna Fundação Calouste, Lisbon; Kinda Foundation, Riyadh; and Tate Modern, London. The Tate is lending one of Al-Azzawi’s most renowned works, the vast mural Sabra and Shatila Massacre (1982-85). Often likened to Picasso’s seminal painting Guernica (1937), Al-Azzawi’s painting depicts the massacre of Palestinian refugees in 1982 during the civil war in Lebanon. Originally published on The Art Newspaper. In this report on the ‘Art for Tomorrow’ conference in Doha in March 2016 I ask the crucial question facing the state of arts in Qatar today: if we focus on the commercial then what about the art? The question of the future is pervasive in the Gulf, almost to the point of becoming a cliché. Nevertheless, the ‘Art for Tomorrow’ conference, a joint project between New York Times Conferences and Qatar Museums, opened up the floor for predictive debate at its second edition ‘Technology, Creativity and the City’. This year’s programme included three days of panel discussions from leading art world professionals, guided visits to local art spaces, and a number of ‘art salons’. 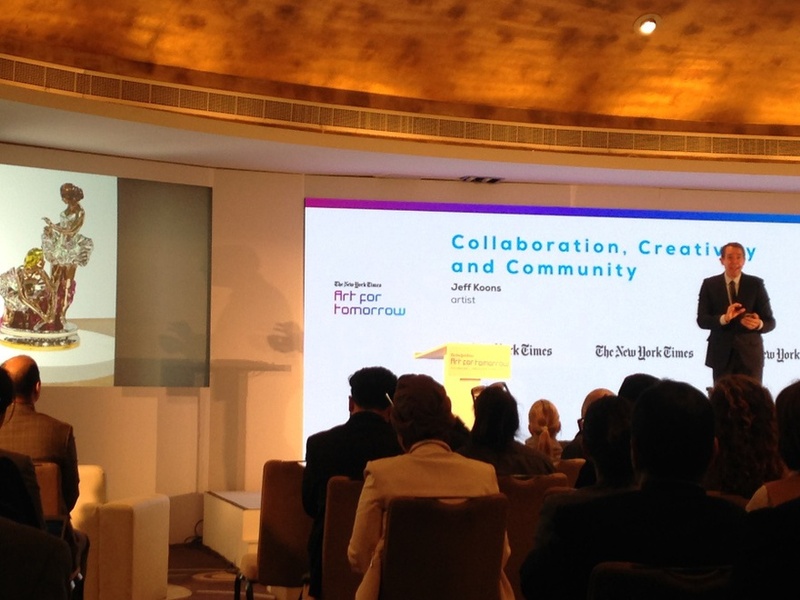 According to Achilles Tsaltas, vice president of New York Times Conferences, the premise of the conference was to consider ‘the role of art as a catalyst for economic growth and development, the role of art as a driver for tourism, and also as a mechanism for nation, city, and even corporate branding’, for which he considers Doha ‘a living showcase’. 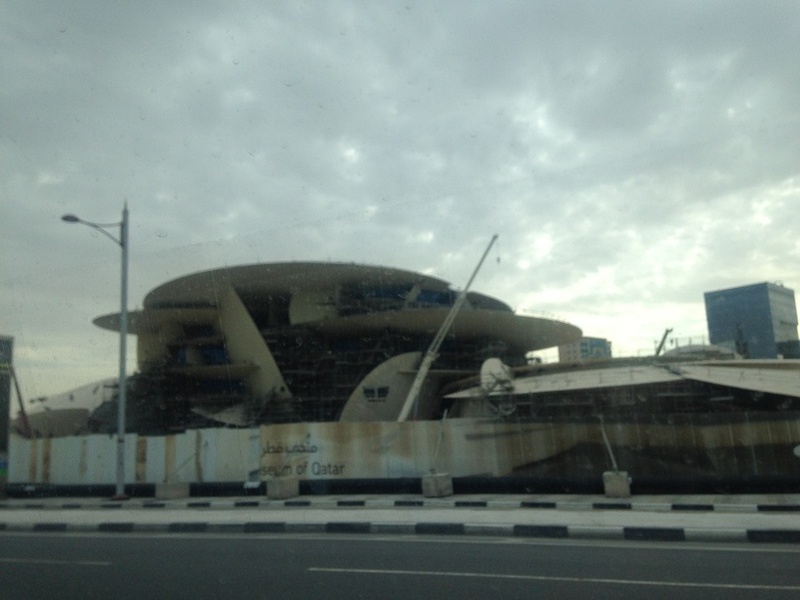 National Museum of Qatar under construction, 14 March 2016. Therefore, and in spite of its title, art took on a tertiary role in the ‘Art for Tomorrow’ conference. The main motivation for the event seemed rather to act as a venue for high-profile artists and arts professionals to network, and as an opportunity to introduce and present Doha favourably to such individuals, all with a predominantly commercial outlook. To this end, the conference was an enormous success – Qatar Museums and the New York Times collectively attracted big stars such as internationally acclaimed artists Jeff Koons and Marina Abramovic, who gave keynote speeches, as well as participants including art collector Dakis Joannou, director of the Victoria and Albert Museum, Martin Roth, and global director of Art Basel, Marc Spiegler. The fact that the cost to attend the conference was around $2000USD further emphasised the purposefully exclusive and commercial nature of the event, rendering it inaccessible to much of the audience in what was openly recognized and discussed as an ’emerging art scene’ in Qatar. Tours of the Museum of Islamic Art and Mathaf: Arab Museum of Modern Art, as well as trips to Gallery Al Riwaq, and Fire Station Artist in Residence (a residency and gallery space), presented the already well-established arts infrastructure in Doha to the high profile conference guests. A tour of the National Museum of Qatar, currently under construction, was led by French star-architect Jean Nouvel (who designed the museum), presenting an exclusive selection of delegates the ‘tomorrow’ that the conference’s title promised. Those who visited returned impressed, but confused – after five years of construction and an expected completion date of 2016, the museum is far from finished and questions about the opening or approximate costs were shrugged off entirely – clearly, ‘tomorrow’ is not quite tomorrow. The impression that art was a circumstantial aspect of the conference was predominantly due to the scheduling of the panel discussions. In what Marc Spiegler described as ‘a rather fast and furious format’, each discussion featured two speakers and a moderator and lasted 30 minutes, each tackling an enormous, and often pertinent, subject. For example, a talk on ‘The Digital Museum’ with the general director of the Rijksmuseum, Wim Pijbes, and Giorgia Abeltino from the Google Cultural Institute barely allowed for an overview of the digitization projects taking place in the two institutions, scratching only the surface of a debate that deserved further analysis and discussion. Similarly, the panel ‘Culture Under Attack’ was predominantly discursive, leaving one feeling that the topics had been chosen for their timely, immediate appeal and irrespective of a desire to engage more deeply with the subject matters. While the art salons allowed for more audience interaction and debate, the overall feeling of the conference was mired by many unanswered questions. Jeff Koons speaking at the Art for Tomorrow conference 2016. The lack of art was a troubling aspect of the conference that ran deep into the fundamentals of the event itself. The conference was hosted by the five-star W Hotel and Residences in Doha – an odd decision considering the array of arts venues that Qatar Museums has at their disposal. There were attempts to assert the missing art elsewhere in the programming – The Lab, a temporary gallery space, was set up on the 29th floor of the hotel and open throughout the conference. Although the starkly un-glitzy aesthetics of the space were refreshing, the curatorial vision of the show – beyond the desire to have some form of art in the conference – was absent. While there were artists speaking during the event, their talks were, again, mere presentations that were not further engaged with. Ahead of Karama’s Eid performance at ALEF Bookstore on Baker Street on 7 July 2016, here’s a look back at an interview with oud musician, Soufian Saihi. In this interview, Soufian discusses how Karama, a uniquely international and eclectic band, was formed; the inspiration behind their album ‘Visa’; and the responsibility of claiming back Arab dignity through music. Aimee Dawson: You started Karama in 2011 – what made you decided to start the band? Soufian Saihi: I have had this idea of starting a band ever since I came to this country in 2004 and these tunes kept coming to me. I went through a bit of a journey before I started the band, though – I went to university to study mechanical engineering in Derbyshire, after that I lived a while in the West Midlands and I moved to London in 2008. This was the real beginning of my musical career. I met this Spanish band here in London and I gigged with them for a while playing the oud. I did a few collaborations and I began developing a network through places like the School of Oriental and African Studies (SOAS) and other interesting venues. Two years after I had arrived in London I had begun to concretise the idea of a band in my head so I started looking for members. I had met Elizabeth Nott through SOAS and had played with her before so I invited her to join, and invited another friend of mine. We began to think about what instrument would go well with the oud and we decided the clarinet would sound good. AD: That’s a really interesting sound combination that you don’t hear very often. SS: Yes, it works really well. We found the other members and I already had four or five songs by then. Our first EP, ‘One Year in London’, was very experimental and was a mish-mash of lots of different ideas. The structure was very different from the norm. I was lucky enough to have met a great sound engineer who suggested that we go and record the music. Then the Arab Spring started, which was such a shock but it brought lots of hope with it. It had been stagnant in the Arab world for such a long time. In the last decades there had been hope that things would change but it didn’t happen. AD: And this where the idea for the name came from, right? SS: Yes, I asked myself a lot of questions about why this was happening now and I thought really it is all about dignity – ‘karama’. People had been oppressed for so long by the regimes in the North Africa and the Middle East. To be honest, it is a very big responsibility, you can’t imagine how heavy it is to have that name – it’s not only about music. I decided to go with that name and it’s a bit of a mission for this band, spreading a bit of love in this world that’s full of hatred at the moment. AD: And that is an important element of culture, spreading positivity and understanding. Did you pick your band members or did it all happen very naturally? Because they each are from a different part of the world – it’s a very international band. Was that intentional? I imagine that these international differences really influence your sound as a band? SS: It does. I always considered myself to be international in spirit – although I’m Moroccan and I am proud of where I come from I don’t want to associate my music with any particular country. I want it to be borderless. With the band members, they kept changing because of the nature of our work in London and people being very busy with different projects. At this stage now we have bonded and we have been together for four years. We have all invested a lot of time and energy in the band and now we are like family. I’m also really happy that we’ve recently taken on two new members so we are now a seven-piece. We have a violin and trumpet. We had our first gig last week at Stroud Sacred Music Festival and it was a great sound. We also had a session on the BBC Radio 3 programme ‘In Tune’. AD: You also have a second album coming up soon – have you started recording yet? Do you already have ideas for songs? SS: We have all the compositions ready but we haven’t started recording yet – we are actually crowdfunding at the moment to raise the money to record the album. I moved from London to Bristol two years ago and that has really helped me to write the new material. I have had more time and space to write. The album is going to be called ‘Visa’. I have personally experienced the difficulties of obtaining a visa and so have millions of other people, so I dedicate it to them and all ‘third-world’ citizens. Sometimes I have this feeling of inferiority because of it; there is a line that divides the North and the South. AD: I think people in the West often don’t realise what a privilege it is to be able to travel so freely and how difficult it is for others. Does the music reflect that feeling of travel, borders and nations? Oh Arab, why did your worthiness fall/ What was the cause of what happened?/ Was your mind drugged or was it your imagination?/ Or were they both lost in a current?/ Amongst you there were a thousand scholars/ Poetry and visionary minds/ Pioneers in geometry, algebra and physics/ You went into a dark deepness/ Only God knows how your history evaporated like water. AD: Your band has a very special and eclectic sound but it is clear that Middle Eastern issues and sounds are its roots. SS: Yes, it’s true. I guess most of the music we hear now in the Arab world is very commercial and I feel like one of the best things we can do to revive Arab culture is to return to basics and build from that. That’s what I try to do with my compositions, following in the footsteps of the old master composers from the Arab world and presenting it with a new, contemporary twist. Book tickets for Karama’s performance at ALEF here. Originally posted on the Shubbak Festival 2015 blog. It’s a difficult reality that galleries around the globe have to deal with: prime locations in the city centre come at a premium. Istanbul’s Collectorspace, just a few metres away from Istanbul’s central Taksim Square has found a resourceful solution to this issue. The former residential building hosts exhibitions in a space not larger than 20 sq. m—once the living room—that are proportional to its size. A single work of art is usually on display, from an important private contemporary art collection, alongside a video interview with the collector and a publication. So far it has hosted works from 15 international collections. Another example of an ingenious use of Istanbul’s urban space comes in the form of an abandoned car park in Tophane’s Boğazkesen Street. Cevdet Erek, who has been nominated for the fourth biennial Jameel Prize and selected to represent Turkey in next year’s Venice Biennale, used the space for the 2015 Istanbul Biennial for his immersive sound project A Room of Rhythms—Otopark. The car park was scheduled to be knocked down for redevelopment but the demolition has since been postponed and Erek continues to use the space for sound projects and encourages other artists to do the same. So far, there have been musical performances with a microtonal guitar and a pocket clarinet, as well as a rendition of John Cage’s 4’33”. Erek is excited to see the project grow, saying: “In a time of extreme security we have an open door space”. The not-for-profit space 5533 is nestled between the shops and cafes of a 1950s shopping centre in the Unkapanı neighbourhood. It opened in 2007 as a satellite venue for the Istanbul Biennial and is fast becoming a base for the Turkish contemporary art scene. Founded by the artists Nancy Atakan and Volkan Aslan and headed by artistic directors on a rolling, voluntary basis, 5533 aims to be a “contact zone” to bring together people from different locations, occupations, and backgrounds to interact, discuss, and display their art-related research. Most recently, the curator and founding director of Protocinema Mari Spirito launched the Proto5533 project, organising exhibitions for emerging artists and curators, with mentoring from established art professionals from Istanbul and abroad. Housed in a former tobacco warehouse, Depo is a huge space that supports artists and collectives as well as civic and cultural organisations in Turkey, the South Caucasus, the Middle East and the Balkans. Their programming doesn’t shy away from the big issues that affect the country and the region, such as the recognition of the Armenian Genocide or the influx of Syrian refugees—despite being located in quite a conservative neighbourhood. “There is a polarisation within society since the Gezi uprisings and that is reflected in the community here. That’s why we are touching on taboo subjects,” says Asena Gunal, Depo’s programme coordinator. Familiar to some who have read the eponymous book by Orhan Pamuk, The Museum of Innocence is a treasure trove of Turkish popular culture and history, as well as a fascinating piece of design and curatorial vision. Both the book and the museum describe life in Istanbul between 1950 and 2000 through memories centred around two families. The museum, which won the 2014 European Museum of the Year Award, is designed as a modern day wunderkammer—each chapter is represented by carefully presented cabinets, which line the walls of the three-storey residential building. Inside you can also find Pamuk’s fascinating “modest manifesto for museums” where he states that the future of museums is “inside our own homes”, rather than in monumental institutions like the Louvre. Originally posted on The Art Newspaper. Etel Adnan’s life is as colourful and compelling as her art. The artist, who was born in Beirut in 1925, is a poet, essayist and painter. Working in a range of media—from oil on canvas to watercolour and tapestry—her bright abstract style has been compared with that of Paul Klee and Nicolas de Staël. We spoke with Adnan on the occasion of her first solo exhibition in a UK public institution, which opens this month at the Serpentine Sackler Gallery. Your paintings are mostly abstracted landscapes and you have lived in many different places: Beirut, California and now Paris. How have these places influenced your paintings? California and Beirut are really my two homes, not only physically but mentally, and so I continue to live in relation to them even though I’m in Paris. I’m still inspired by these landscapes because I’m still haunted by these places—they are still in me. I spent most of my life in California, where I had a view of a mountain from my window and, willingly or not, it entered my psyche and also my writing and painting. You begin to live with it even when you can’t see it. Your show at the Serpentine is called The Weight of the World, but much of your work is about weightless things, such as shadows and light. Where does this heaviness come from? The exhibition takes its name from a series of works that all feature circles. In this case, the expression “weight of the world” is less psychological and more physical—a big circle weighing down in each work. This new series was painted a year ago. I made the first one and Hans Ulrich Obrist [the artistic director of the Serpentine] happened to see it in my studio in Paris and said I should do more. Many Lebanese artists—Mona Hatoum and Walid Raad, for example—refer to the Lebanese Civil War in their work. How has the war affected your work? Tragedies indirectly foster creativity—[they] create tension. Look at Picasso’s Guernica; it’s like you have to create something at the same level of the tragedy that you are living in. In my own work, my response to such tragedies is more in my poetry and writing than in my painting. On the other hand, it’s not only war that can inspire creativity—overwhelming beauty can also create overwhelming works. For example, Monet’s Water Lilies triptych is epic. Nature is overwhelming if you really look at it. It’s a burst of fantastic energy. It’s a sort of positive apocalypse. Original article at The Art Newspaper. Fan of Fanoon is a blog dedicated to the contemporary arts and culture of the Middle East and North Africa, offering reviews of exhibitions, events and films as well as short essays on artists and cultural practices within the region.